The Daily Click ::. Forums ::. Daily Click ::. FlannVille - Where is it? just wondering where it has gone, and if its still being updated etc. Alee is a Moo proggrammer and is a 3d graphics artist. Hill Gigas (Scott Cawthon) deleted it. That's pretty sad. Same with Smiley House and Seek and Dread. Some of the best online multiplayer games made with Fusion. I think I might have the source code to Smiley House somewhere, but I don't have the server and I can't open the source since I'm missing some old Fusion 1.5 extensions. The server believe it or not was written in Jamagic. At least that's what I remember code telling me. I thought about making a fan game of smiley house given it's simple graphics, but the amount of work it would take for a fan game made me stop. It'd be great to have a copy of the old source code for SmileyHouse if you could find it. He gave me the source on the old Puchisoft forums in a PM, but the site is gone now. I downloaded it, so it might be on my PC somewhere. I couldn't find it in my dropbox. I'll have to check for it when I get home. The client and server code is both in there. There is something you have to do to get the client to realize it's up to date now that the server is down, but I'll try to get that posted later. 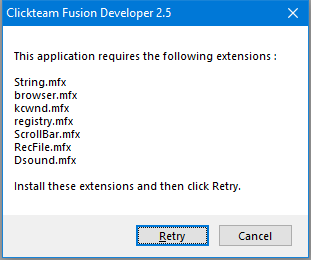 Edit: I think that some of these extensions were included with Fusion 1.5 or 2. I'll have to dig up my disks and check. SmileyHouse was designed for MMF 1.5. For any extensions you can't get you can copy and paste an existing .cox file and rename it. It'll let you open the file in MMF 1.5, even if it won't work properly with that extension.